Sometimes you can make a great image just by sitting in your living room. 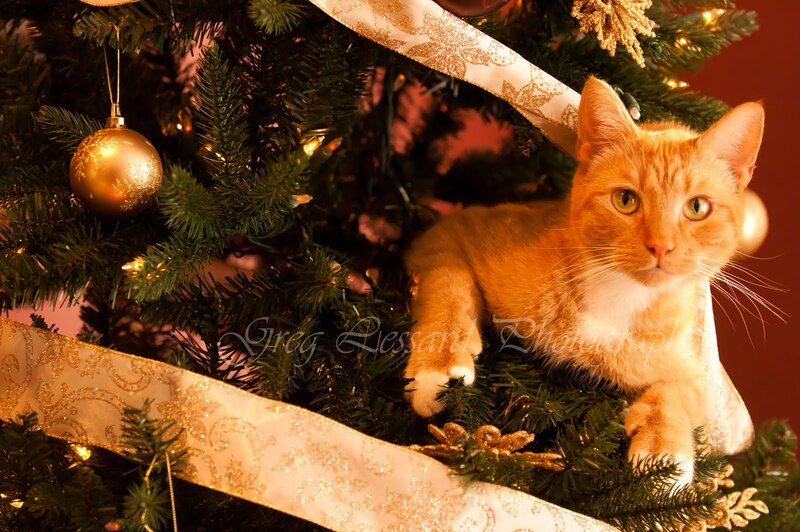 My cat Tigger loves to climb trees. Christmas is a fantastic time of year for him. He spends every spare moment near the top of our tree. My beautiful wife Brenda spends her evenings chasing Tigger out of the tree. Of course, I spend my evenings photographing it all. For this image I used techniques from a variety of photographic styles. Knowing my cat’s behavior allowed me to be prepared for when Tigger made his nightly appearance as a Christmas ornament. Basic portraiture and lighting techniques that I have acquired from my experience as a wedding photographer helped me to make this impromptu image. 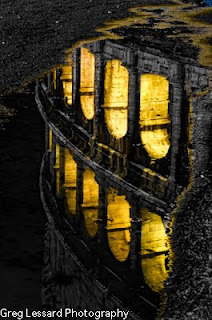 As photographers, we often define ourselves as practitioners of various styles of photography. For example, I consider myself first and foremost a landscape and nature photographer. However, I do not limit myself to nature photography. There are numerous styles and genres to be explored within photography. I love photographing weddings and creating travel images. Keeping an open mind is key to growing as a photographer. I once met a biologist working toward his doctorate. He had spent two years studying desert foxes. He had become an expert on that animal. For his final project, he had to study an animal that was completely opposite from the desert fox. He chose to study Atlantic puffins. That project forced him out of his comfort zone and broadened his understanding of the natural world. It is easy to draw a parallel from the biologist’s story to that of being a photographer. Instead of photographing only one style, challenge yourself by photographing outside of your comfort zone. What style is most opposite from your forte? Can you learn lessons from the new style that will strengthen your favorite idiom? The last thing a “landscape photographer” would make an image of is an indoor cat. If I had narrowed my options to only landscape or nature images, I would not have made this image. Is this image an outstanding piece of art? Not necessarily, but it certainly makes me laugh every time I see it. Sometimes we need to remember not to take ourselves too seriously. After all, we photograph because it is fun and we enjoy it. This month’s tip: Always have your camera ready. Be prepared for that once in a lifetime memory that will arrive and disappear at a moment’s notice. Having a fresh battery, an empty memory card and the correct lens prepared is priceless. This image is one of my favorites from "The Year of the Snowy Owl" exhibit. It is the only black and white image in the portfolio. I love the texture and details of both the owl and the cedar tree. The title of this image is "Wisdom". I spent more time with this owl than all of the other snowy owls combined. It had a large red marking on the back of its head showing that it had been a frequent flyer at Logan airport. I nicknamed him Big Red, even though he was on the small side for a snowy. He was a hatch year, male owl. Many of his habits and preferences became apparent to me as I observed his behavior throughout the winter. After a while, I started to feel like he was an old friend. I often wonder how he has fared since he returned to the arctic. I will be presenting my popular winter photography workshop at the North River Sanctuary of the Massachusetts Audubon Society in Marshfield, MA on November 17, from 1-3PM. We will discuss a variety of important tips and techniques to help take your winter photography to the next level. 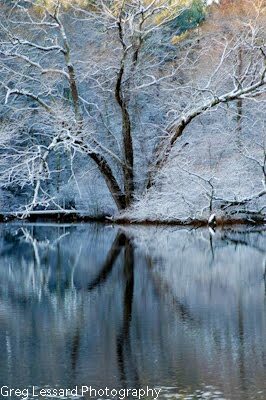 Among other things, we will discuss winter clothing, how to make great images of snow and how to keep your camera healthy during a harsh winter storm. Most importantly, we will learn how to keep our hands and fingers from becoming frozen blocks of ice:) I will use a series of my favorite winter images to illustrate our discussions. At the end of our session we will take a short walk on the North River Sanctuary property to practice our newly learned techniques. I would like to thank everyone who has helped me with "The Year of the Snowy Owl" exhibit. This exhibit has taken years of study, months in the field, and numerous hours of planning and preparation. I most certainly would not have been able to do this by myself. I fear that I will forget someone when I name names, but these people have been wonderful and supportive, each in their own way. First, my dad (Ranger Bob) for inspiring me with a love of nature. My mom for making me do multiplication table flash cards, penmanship, tying my shoes and algebra. She taught me the persistence and dedication needed to succeed. Thank you to Mark Wilson for sharing his art and inspiration. To John Galluzzo for being incredibly supportive and for his humor keeping things light. Sue MacCallum and all of the Audubon staff and volunteers have been fantastic to work with. Thank you to the cookie brigade, Ellen Adams, Veronica O’Neil and Michelle and Anthony Galluzzo. To all of the photographers and birders who have accompanied me on the long walks and given me updates on the latest sightings, especially Hans Zimmern. Thank you to all of those who have helped me get the word out: Jane Lopes, Amy Davies, Karen Blair, Lisa Cuchara, Jacqui Mysliwiec, Carol Smith and Tim Kelley. Thank you to everyone who reads my blog, attends my workshops and purchases my prints. Thank you to all of the friends I have made along the way. Thank you most of all to my wonderful wife Brenda. She is incredibly supportive and patient. Without her, I don’t know where I would be. Brenda makes everything more beautiful! 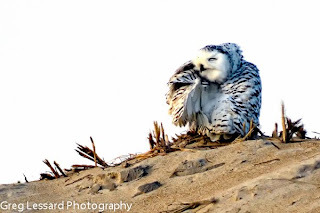 Please join me for the opening of my exhibit "The Year of the Snowy Owl". 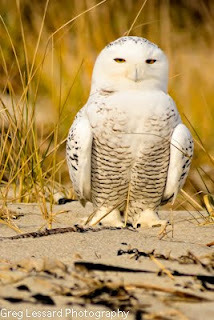 I spent the winter of 2011-2012 photographing snowy owls. This exhibit will include twenty of my favorite snowy owl images and writings about my experiences photographing them. 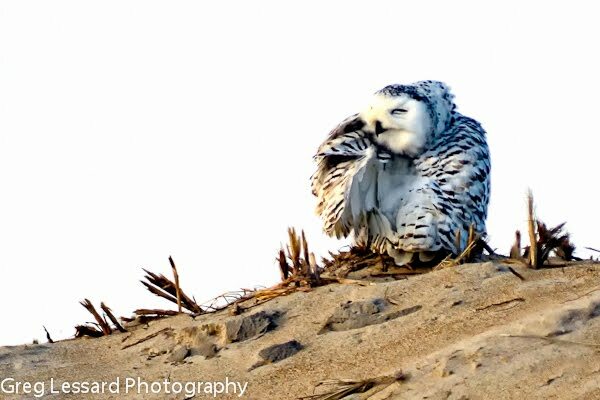 The images will include many beautiful owl portraits and an action sequence of a peregrine falcon attacking a snowy owl. The exhibit will be held at the Massachusetts Audubon North River Sanctuary in Marshfield, MA from 2-4PM on November 3, 2012. It will run until November 21. I hope to see you there! 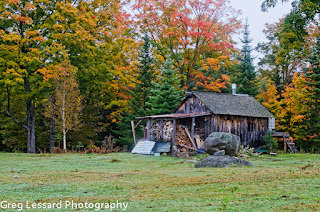 On my recent workshop to Acadia National Park, we stopped at the beautiful Stone Barn Farm in Bar Harbor, Maine. Our visit was serendipitous. Every moment of the visit was better than the last. 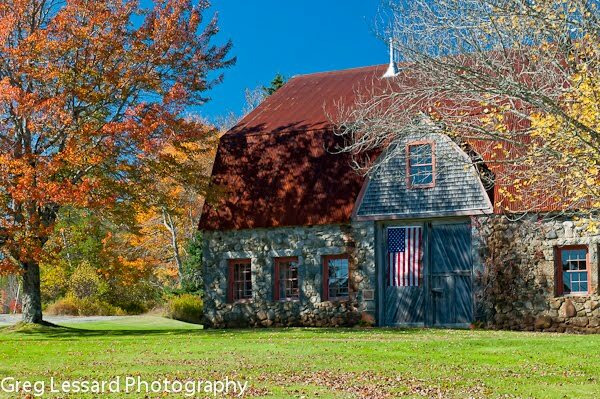 The Stone Barn Farm was built in 1820 and it is on the National Register of Historic Places. 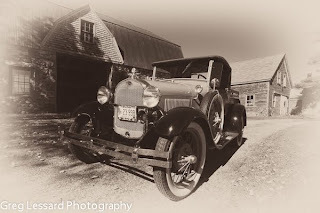 One of the workshop participants had requested a stop at the historic farm. As we arrived, I knocked on the door of the farmhouse and was greeted by a loud, deep bark that emanated from a large French mastiff ala Hooch from the movie “Turner and Hooch”. Fortunately, his owner, Mrs. Owen had him under control. She graciously allowed us to photograph her farm. Soon, we were making many satisfying images, especially of the famous stone barn. After fifteen minutes of enjoying the scenery, a man drove up in an antique yellow Chevy pickup truck. Mr. Owen had arrived home in style and he was quite a sight to see. Harry is 85 years young and vibrant. He gladly positioned his truck ideally for photographing and then he happily posed for us. After a few minutes, Harry asked us if we liked green trucks. 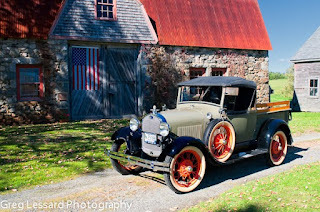 We enthusiastically said “Yes.” Much to our delight, he opened the barn door and hopped into his 1929 Model A Ford pickup. It was even more intriguing than the previous truck. Harry spent some time posing with his truck and discussing its color. He had spent a long time researching the name of the color. It turned out to be “Commercial Olive” as confirmed by the Ford Motor Company. Commercial Olive made for a subtle contrast against the grey and red barn with the proud Stars and Stripes hanging from the door. We were soon greeted by Rufus, the aforementioned French mastiff. He seemed much friendlier as he came to greet every photographer. He was one of the most handsome, yet ugly dogs that I have ever seen. He was an enormous, energetic, yet friendly five year old pooch. I am so glad that Harry had him well trained. Rufus was the cherry on top of our photographic sundae. 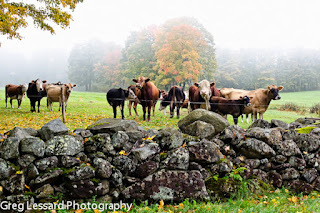 All told, we spent less than an hour at the Stone Barn Farm, but we all agreed that it was a fantastic highlight of our visit to Acadia National Park. This Month’s Tip: Take the time to introduce yourself to the people who you photograph. Then listen to what they have to say. Their story will enhance your photography. These four images were made on my recent workshop in Acadia National Park. We got up early for sunrise and stayed out late for sunset. Pre-sunrise and post sunset are some of my favorite times of day. The first image of the silhouetted pine tree at dawn has the moon and Venus shining in the early morning light. This image concept was a rework from my film days in the late '90's. Silhouetted trees along the shores of Acadia are simply beautiful. 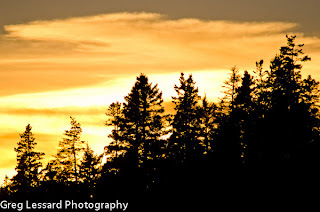 The second image is of, you guessed it, silhouetted trees near Bass Harbor. The sun had set and the colors of the sky were starting to burn. I made this image with my long lens, the Tamron 200-500mm. The extreme length of that lens allowed me to isolate my subject from an other wise cluttered background. The third and fourth images are from the western side of the island. The third scene was made famous by Edward Weston. This is my version of the famous view. The fourth image is of one of my favorite scenes that few people ever notice. Acadia is full of photographic opportunities. They abound around every corner. 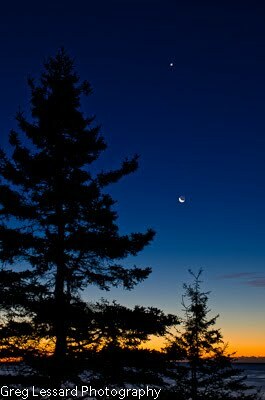 Last weekend I led a workshop in Acadia National Park. It was a great weekend with excellent weather and even better company. On our first night, some of the participants wanted to try some night photography in the park. 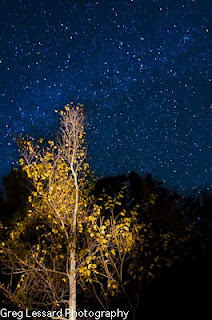 We went to Eagle Lake and photographed the stars, mountains, lake and foliage. The stars were more bright and clear than in any place I have ever been. The cold weather and the dry atmosphere certainly helped. We had a clear view of the milky way. It was pretty amazing! The first view shows the reeds along the lake with the mountains of Acadia in the background. It was a 25 second exposure at f2.8, ISO 1600. This image was made with my D7000. The second image shows a birch tree with the milky way above it. The foliage on the tree was a yellowish green. With a little help from NIK, the foliage became a more pleasing yellow. It was great fun to be photographing at night and working as a team with a great group of people! 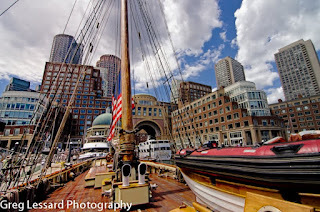 I spent two great days photographing the Northeast Kingdom last weekend. 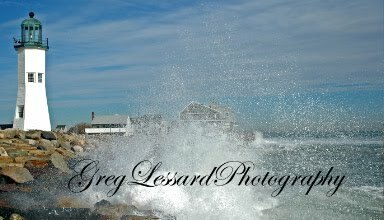 My friend Carol invited me to join her and the South Shore Camera Club for the weekend. Carol brought us to many of her favorite places. I have posted four of my favorite images from the trip. This image was created on a small mountain pond. The owner's of the canoe were outstanding. 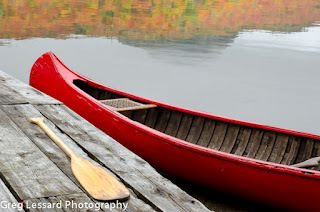 They paddled around and around the pond for us to photograph the canoe in a wonderful reflection of a mountain with plenty of foliage. Afterwards, they invited us to their cabin for a better view of the lake. They had a great rustic cabin. No water, no electricity, just a couple of bunk beds and a large pile of fire wood. I was quite impressed with this cabin. Its view was fantastic, overlooking the pond and the surrounding mountains. What a fantastic family retreat! These cows appeared out of the fog and greeted us like old friends. This was classic Vermont. I had hoped for an image just like this! Of course my primary wide angle lens malfunctioned while making this image. Not a bad image for a broken piece of glass! 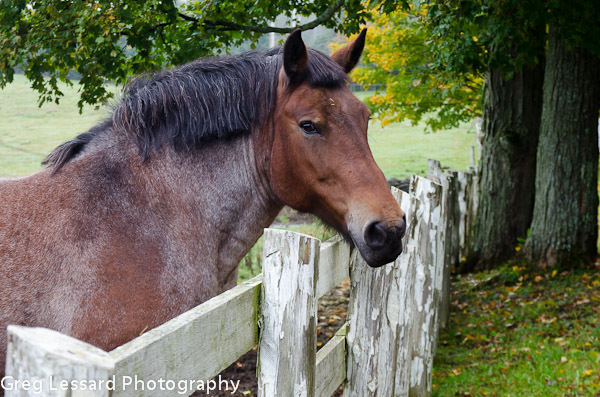 This beautiful draft horse quickly became my bud. He came over to check us out and soon I was petting him on the forehead. I was impressed with his new haircut. He was a very friendly horse and it was a thrill to meet him! After the club split up and went their separate ways for home, my friend Al and I returned to a favorite farm. We met the owner and she invited us to visit her family's sugar shack. It was hidden on a long dirt road and surrounded by excellent foliage. It was quite a treat to see a part of Vermont that few other people have visited! 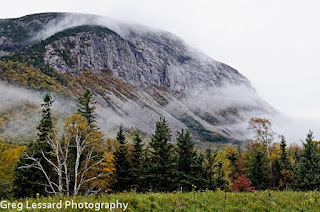 Passing through Franconia Notch last weekend provided fantastic opportunites to view some fall foliage. At dawn, there was thick cloud cover and fog throughout the notch. Occasionally, the fog would lift just enough for a view. In my opinion, the fog enhanced the views. The first image was a quick snapshot made from a pullout along the highway. The beauty was undeniable, but I did not have time to stop for long. I was on my way to visit friends and photograph the NEK. I did not want to be late. On the way home, I stopped to make an image that I had envisioned earlier in the summer. 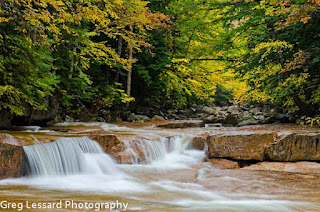 I found a nice spot along the Pemigewasset River in Franconia Notch State Park. Hiking to this spot in the rain was quite a challenge, but it was worth it. My dad made the hike too and we had a great time photographing the river together. This weekend I traveled to the Northeast Kingdom and joined my friends from the South Shore Camera Club for some fantastic fall foliage! My friend Carol organized and hosted the event. She brought us to many of her favorite places in the NEK. We had a great time with many fantastic views. This image of a feather on a red maple leaf was one of my favorites. I found the feather and the leaf near each other and realized their potential. So I put them together and had a great time with my macro lens. Many times, people ask me if I am breaking the rules when I relocate leaves to enhance an image. My answer is it depends. If I were to represent this as a found image, meaning that nature made this, then yes, I am breaking the rules. However, if I am simply creating art, my answer is no. Photography is an art form. The confusion comes when we think of photography as a representation of reality. If this were a painting, no one would care if I moved the leaf and feather. If the subject was a bowl full of fruit, it would be expected that I had arranged the elements of the subject to be most pleasing. This is a still life of natural subjects, plain and simple. Some photographers insist that I have committed a gross misrepresentation of nature by rearranging these natural elements. I contend that photography is art and the artist maintains control over what is permissible and what is not. I agree that as photographers, we should admit when we have created a still life. The veracity of an image is important. After that, it is truly up to each artist to decide how they will present their vision and images. So, in summary, I believe that it is permissible and in fact imperative to create art from nature. However, if we change elements of an image and or rearrange these natural elements, it is critical that we be honest about it. Furthermore, I would strongly argue that we should not harm nature to create these images. 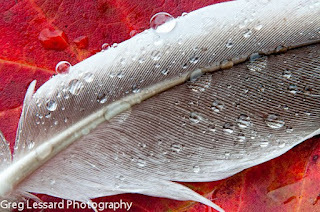 Finding a fallen feather and a fallen leaf is a perfect example of creating art from nature without causing any damage. I did crop some grass to improve this image, but considering that we were on a lawn in a state park, I don't think that I did any harm. For full disclosure, I also cloned a part of the feather to cover up a small piece of grass that I found to be distracting. In for a penny in for a pound. It was Thanksgiving morning 2011. While many people were still sleeping, my dad and I were walking along a beach at sunrise. We were looking for snowy owls. As we made our way down the beach, we found a snowy perched on a pole, overlooking some grass lands. While observing from a safe distance, we met one of my favorite photographers, who is also a snowy owl expert. He cautioned us on how to safely approach a snowy owl. His advice was to stay low, move slow, be quiet and don’t get too close (not closer than 50 feet). After watching the owl for a while, we moved further along the beach. There were some duck hunters, who were cooking up a storm in the back of their truck. They greeted us cheerfully and offered us some ham and eggs. As we chatted with them, they began to cook tuna fritters. This was their Thanksgiving tradition. One of the hunters had been a cook in the Navy. He knew his way around a camp stove. The tuna fritters were one of the best seafood dishes I have ever had. Even at 7AM! As we enjoyed the culinary delights, the astronomical high tide began to set in. Soon, the hunter’s truck was surrounded by water. It was time to leave. My dad and I hitched a ride with the snowy owl expert, but first we had to get to his truck. On the way to the truck, we crossed a flooded section of the beach. As we picked our way from dry spot to dry spot, we spotted a snowy, not far from us. The owl was in a gnarled, old cedar tree and it had perfect early morning light shining upon it. Behind the owl was a mix of blue sky and fast moving, softly lit clouds. 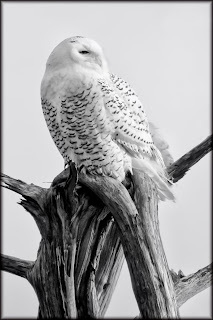 This was an amazing opportunity to photograph a snowy owl. Everything had come perfectly together. We moved our tripods into position and gladly stood in ankle deep water to make the image. We spent a fantastic few minutes with this owl until it was spooked by a passing truck. This was a surreal moment that I will never forget! Driving off the beach, we spotted a snowy owl at a great distance. As we observed it, another owl attacked it! The snowies flew into the air and had a fast moving, talon to talon aerial battle. 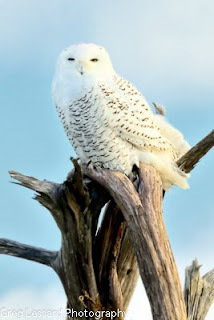 The owl expert said that he had never seen such a display in all of his years of studying snowy owls. My dad and I were very lucky to have witnessed it! This turned out to be one of my favorite adventures in 2011. Spending time with my dad, meeting one of my favorite photographers and enjoying gourmet seafood while photographing snowy owls was fantastic! This month’s tip: Set goals for yourself as a photographer. Learn new techniques and try new styles of photography. This will improve your photography and hopefully inspire you at the same time. Greg Lessard is a professional photographer. 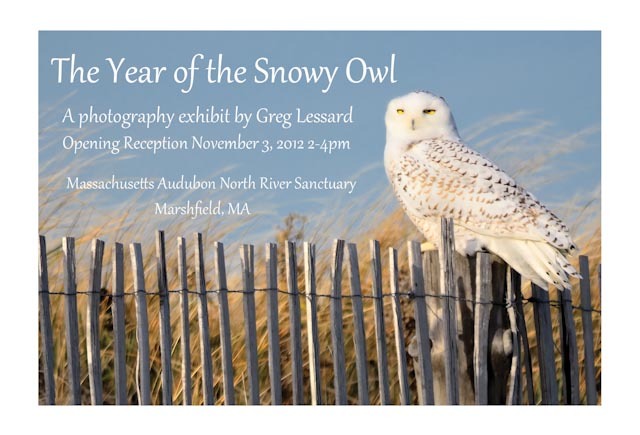 You can meet him and view his exhibit “The Year of the Snowy Owl” on November 3, at the Massachusetts Audubon Society’s North River Sanctuary in Marshfield. On my recent trip to Italy, I was able to photograph the sunset from high atop Montelpulciano. This Tuscan hill town has a commanding view in all directions. 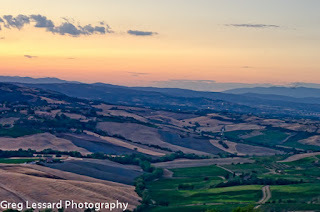 To the west is the beautiful Val D'Orcia. The Val D'Orcia is legendary for amazing pastoral landscapes. Winding roads leading through rolling hills and fields of wheat make for unparalleled landscape opportunities. After the sun had set, beautiful colors played across the sky and the land. I spent a long time watching the last light of day play across the land. It was a fantastic evening! Last night I made a presentation on fall photography to my friends at the South Shore Camera Club. It was great to catch up with some old friends and meet so many new people! We talked about many things including the use of polarizers, how to find the best foliage and how to take advantage of different types of light in your fall photography. After the presentation on fall photography, I presented a slide show of some of my favorite images from my recent trip to Italy. Then we discussed how to keep our camera equipment safe while traveling abroad. This was done in anticipation of the club's upcoming trip to Italy. The image posted here was made seven years ago. The fresh snow on the fall landscape made for an outstanding juxtaposition between fall and winter. The reflection combined with the three trunks of the tree make for a compelling composition. 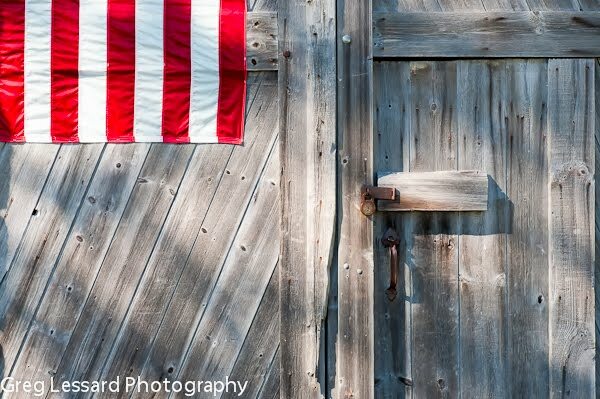 This has been one of my favorite and best selling images. I was very fortunate to be prepared with my camera on my way to work. The tree fell later that winter. Thank you again to the SSCC for hosting me last night! For many years I have been inspired by some photographs in one of my favorite local Italian restaurants. Every time I dined there, I would gaze at the images of the Coliseum in Rome and St. Mark’s Square in Venice and wish I could be there too. This summer I finally visited these places of my dreams. Having studied the images in the restaurant so many times, I have every detail of them memorized. When I was actually standing in these locations it was difficult to conceive of a different way to photograph these iconic locations. Photographing iconic locations can be fantastic. Standing in the same spot that master photographers stood at and created great images in the past, is a wonderful way to study the craft of photography. Simply trying to recreate masterpiece images is a great way to improve your skills and understanding of photography. Another step towards improving as a photographer is to visit iconic locations and create new images. This is harder than it may seem. Iconic locations have been photographed and painted thousands, if not millions of times. Finding a new way to portray them can seem nearly impossible. 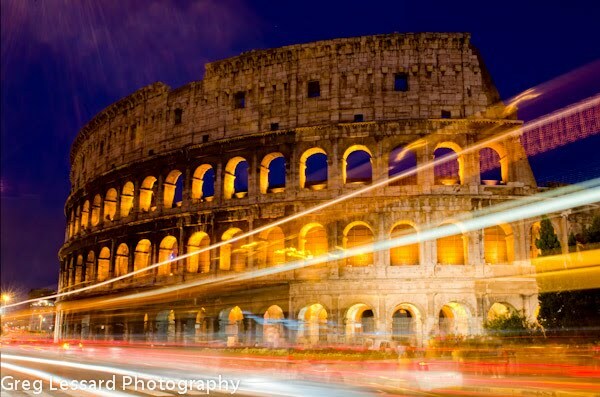 On my recent trip to Rome, I was able to visit the Coliseum multiple times. On the first and second visit, I made images that were similar to those that I had seen before. I was happy with those images, but I knew that I had not added anything of my own to the scene. On my third visit to the Coliseum, I went after a late afternoon rainstorm. Stormy weather often provides the opportunity to create great images. I was not disappointed. I started with some street photography in front of the Coliseum. I kept my shutter open for 20-30 seconds and allowed the traffic to zoom through the frame with bright tail and headlights. These images were very pleasing to me, but I was standing next to another photographer who was making similar images. I knew my images would be unique, but I could only imagine how many times similar images had been created before. Crossing the street, I headed towards Constantine’s Arch to search for a new composition. I didn’t have to go far before I found a large puddle reflecting the Coliseum in all of its glory. I studied the scene for a few moments and decided to photograph only the reflection. The puddle thinned out at the top of the frame making it look almost like a river flowing into a lake. I placed that thin part of the puddle in the upper right corner to pull the viewer’s eye into the image. After making a few images of the reflection, a Russian lady asked me what I was waiting to see. I showed her the reflection and the image that I had made. She was very surprised to see something that was right in front of her. Like most people, she had probably only looked at the Coliseum in the same ways that we have always seen it. This month’s tip: Try seeing familiar locations in new ways. View them from above or below your normal vantage point. Visit these locations at different times of day or in different seasons. Look at them upside down. You may just find some art in your everyday life. Here is the latest article in my Adventures in Photography series. 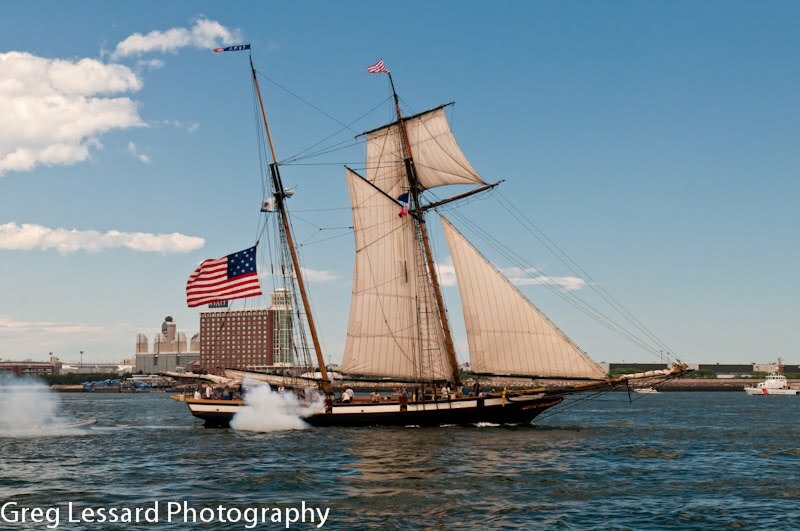 I was thrilled to sail aboard the Pride of Baltimore II earlier this month, while it had a mock battle against the Lynx in Boston Harbor. 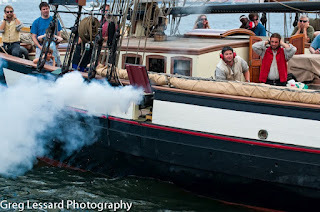 This was part of the OpSail 2012 celebration, commemorating the 200th anniversary of the War of 1812. You can also see this article in the Freebird Times. 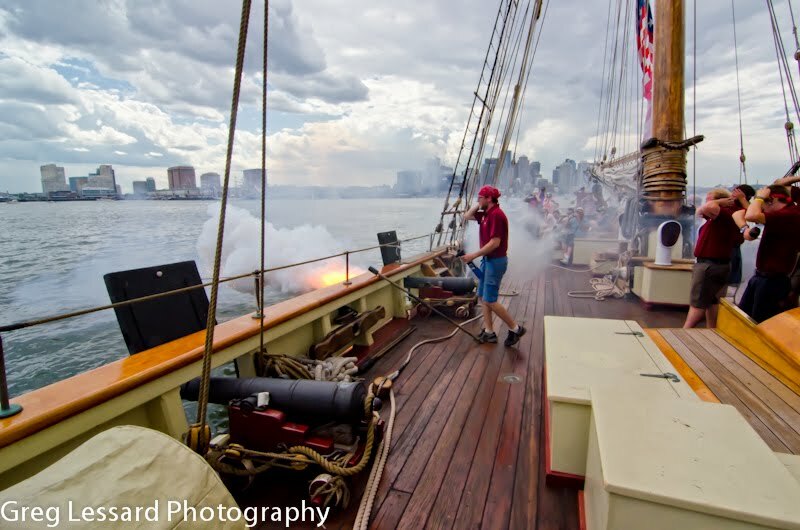 BOOM….the canon fire roared off of the deck of the Pride of Baltimore II. The crew was taking aim at its mock enemy, the Lynx. 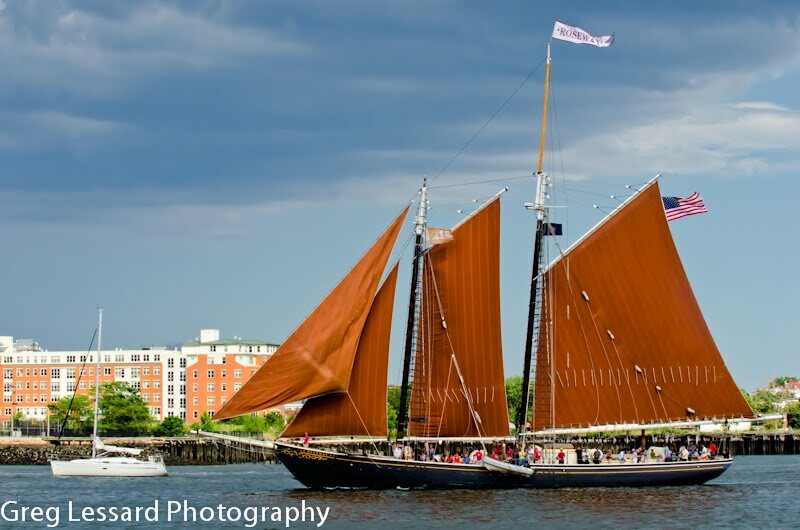 Both ships are Baltimore Schooners, a highly specialized type of sailing vessel that made its naval debut in the War of 1812. Sleek lines and shallow drafts make them highly maneuverable and very fast. This deadly combination surprised the British and helped the Americans balance the War of 1812 at sea. 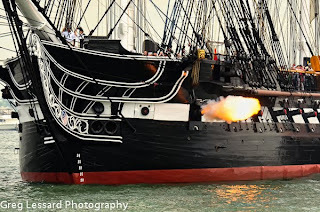 The British had an undeniable naval superiority in the War of 1812. Their basic plan was to cut off the Americans’ supplies by dominating the shipping lanes of the Atlantic and blockading American harbors up and down the East Coast. While these ships were not designed to stand toe to toe with British ships of the line, they were very capable of running blockades and capturing enemy merchant vessels. 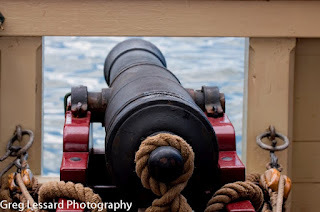 They were so lethal to British merchant ships that the British Navy had to devote many vessels to protecting them from the American privateers. 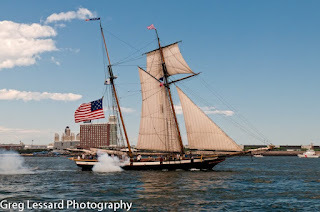 The most famous event of the War of 1812, the penning of the Star Spangled Banner, happened as a direct result of the British trying to destroy the shipyards where the Baltimore Schooners were constructed. Fortunately for the Americans, Fort McHenry withstood the attack and Francis Scott Key would later have his poem immortalized as our country’s national anthem. 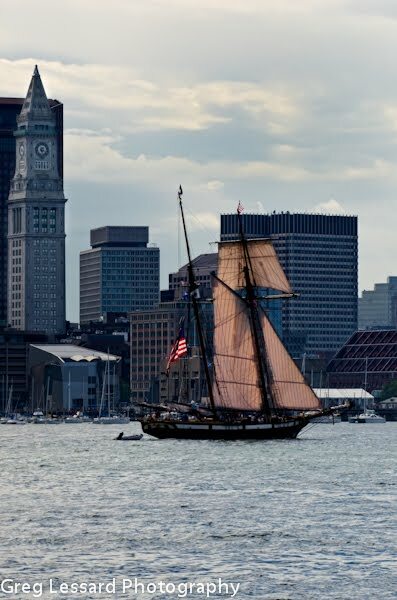 Today, the Pride of Baltimore II sails to ports around the world to promote the history of the Baltimore schooner and its role in the War of 1812. 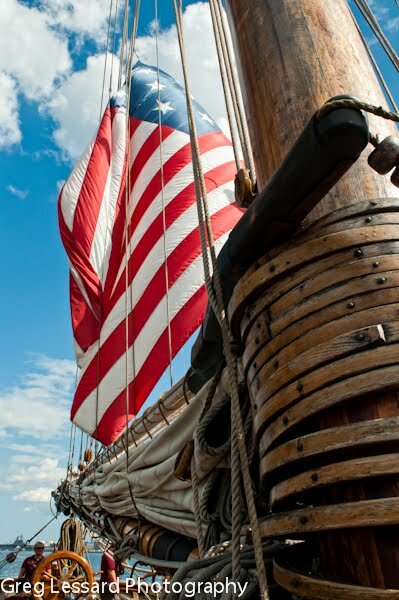 The mission of the Pride and its crew is to allow the public to interact with a living piece of American history. “Experiencing the Pride under sail is a link to our history. 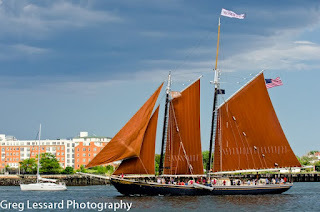 We do all of the maneuvers under sail like it would have been in 1812, showing the phenomenally nimble design of this type of schooner,” said Captain Trost. 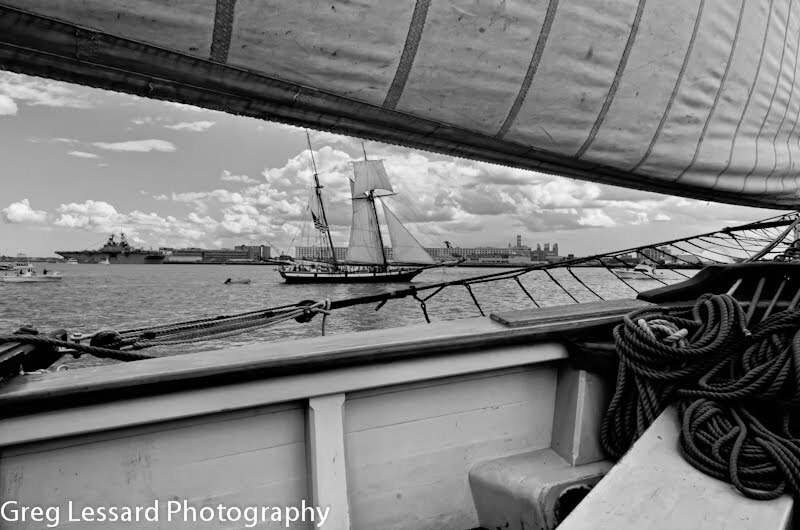 Quite frankly, the historical nature of sailing on board the Pride cannot be denied, but the chief reason for many people to sail on this beautiful ship is that it is fun! 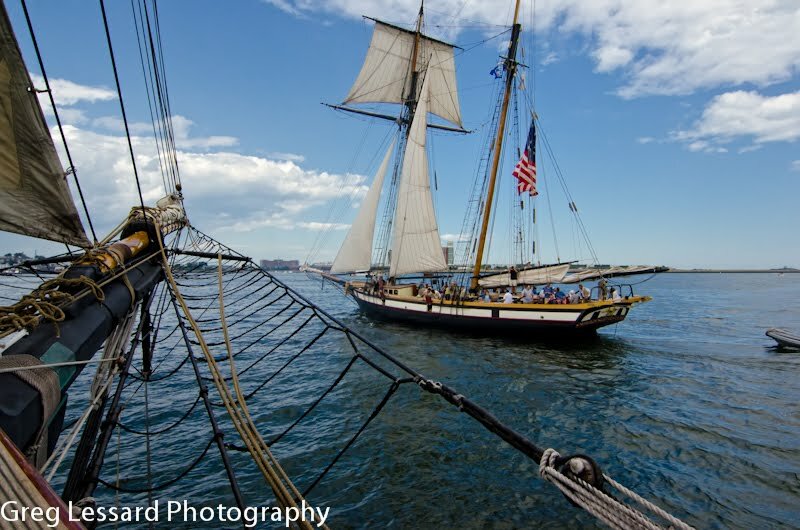 Being on board while the Pride participated in a mock battle in Boston Harbor was the thrill of a lifetime. Watching the crew perform one tactical maneuver after another, while firing four canon at their “enemy” was exhilarating. 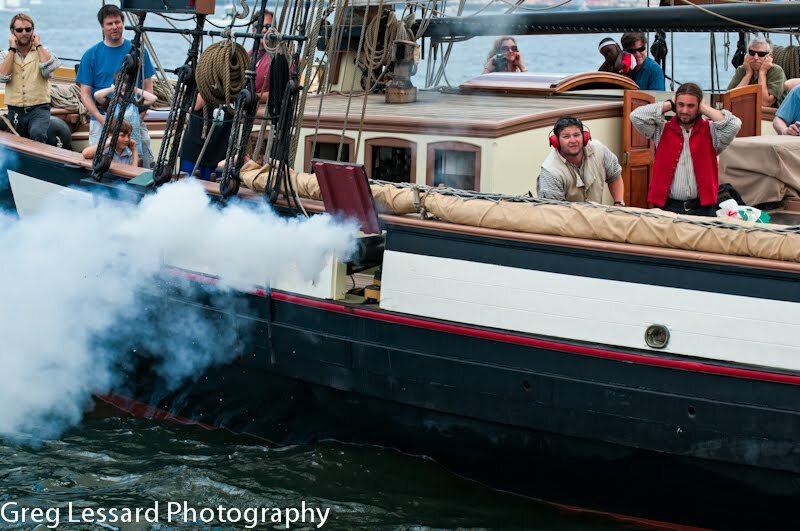 When the canon fired, their power resounded, causing many hearts to skip a beat. Bringing history to life, the Pride was far more inspiring than any text book could ever be. This Month’s Tip: Captain Trost is also an accomplished photographer. I asked him, “What was the most beautiful thing that you have ever photographed while sailing aboard the Pride?” He said, “Last summer, we were sailing in Lake Superior, near Pictured Rocks National Lake Shore, late in the day. There was a rock formation that looked like a dragon. Many people didn’t believe that it was a photograph. They thought that I had photoshopped it.” Amazing beauty can be found all over the world. Are you ready to sail to your next adventure? that the owl had flown from. Then as I observed the bird sitting in the tree, I realized that it was much wider than any hawk. 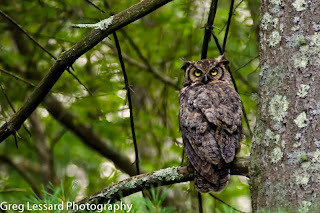 It was none other than the great horned owl. I asked Brenda to keep an eye on the owl and I quickly went to get my camera. I was very fortunate to have just enough light to make a decent photo. I was also very happy that the owl held still and posed for long periods of time! Thrilled to have such a beautiful bird in my backyard! 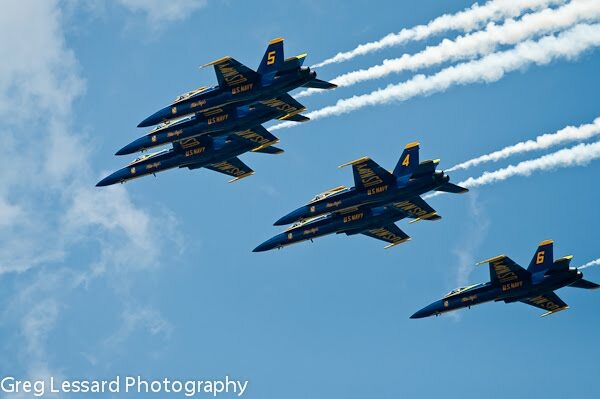 On July 4th, the Blue Angels were scheduled to perform a fly over the U.S.S. Constituion at 12:22PM. They surprised me and other photographers when they took off from Logan Airport at 12:02. They flew right over Boston Harbor, very close to the Constitution and Fort Independence. There were four news photographers there and I believe that I was the only one to get the shot. It was quite stunning to see and hear them rocketing through the skies! The Blue Angels took off in a formation of four. A few minutes later two more came rocketing off the runway surprising us again. Finally, a lone Blue Angel flew across the harbor and into the clouds. 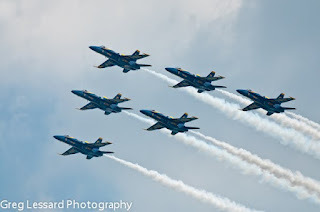 When the Blue Angels reappeared, they were in a formation of six, with no sign of the seventh jet. They flew over the Constitution towards Boston at exactly 12:22. They returned for two more flyovers before returning to land at Logan. It was quite a thrill to see them and to be in position to photograph them! In order to make sharp photos of such fast jets, I set my ISO to 800 on my D7000 and 400 on my D90. THe D7000 does a much better job of handling noise from high ISO's than the D90 does. I could have set the ISO much higher than 800 on the D7000, but I didn't need to. With bright sunlight, I was able to achieve a shutter speed of 1/2500 of a second which was more than enough to freeze the fast jets in place. These images were all hand held. To be honest, I found the Blue Angels to be quite easy to photograph compared to most of the birds that I have practiced on in the past. For starters the Blue Angels are a significantly larger target than say a snowy owl or a tree swallow and they fly in a perfectly steady path, making it relatively easy to track them. It was fantastic to photograph them and I can hardly wait to get to another air show! Here are two photos of the Constitution on July 4th. 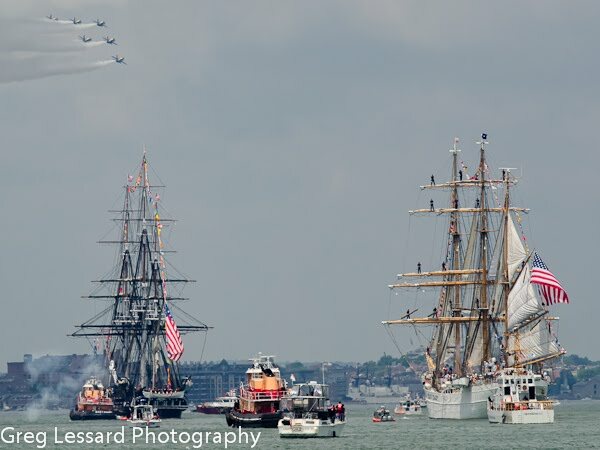 This year's annual turn around was extra special, because it comemorated the 200th anniversary of the War of 1812. The Constitution earned its nickname of "Old Ironsides" during its many battles in the War of 1812. The British were dismayed by the extra thick oak planking that simply repelled their canon balls. At worst some of the canon balls were lodged into the wood. This was quite a benefit to the American sailors who were saved from the deadly splinters that would usually result when a canon ball came shattering through the sides of a ship. 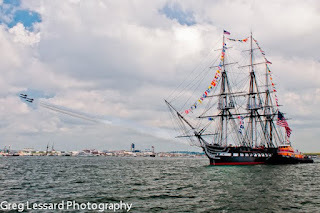 Today I went to Castle Island to photograph the U.S.S. Constitution as it performed its annual turn around. 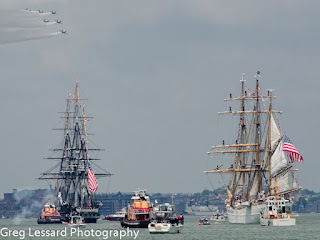 The Constitution was accompanied by six tall ships, two fire boats, numerous police and Coast Guard boats, tugboats and fly overs by the famous Blue Angels! This event was a dream come true for me. 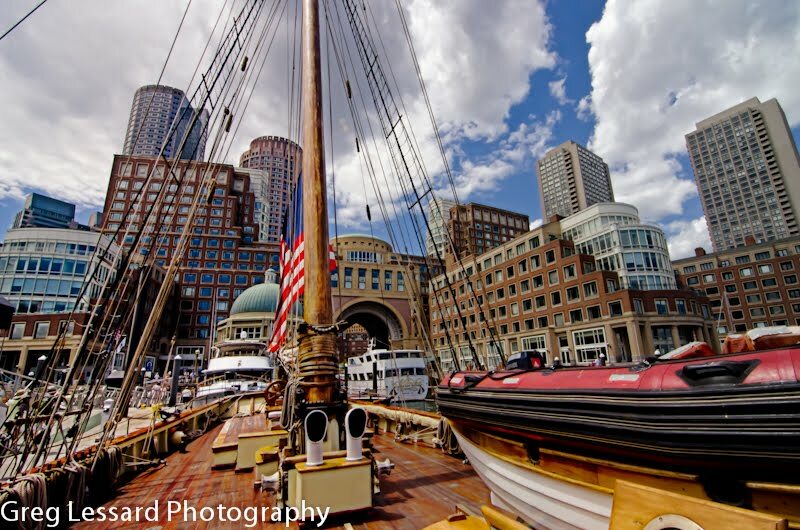 I have wanted to photograph this event since 2000, when I attended my first tall ship event in Boston. I am fascinated by American History and the Constitution has excited my imagination since I was a little boy. To see the Constitution firing its canon and flying its colors, while being saluted by the Coast Guard Eagle was absolutely amazing. Then the Blue Angels flew off the runway from Logan airport at what seemed like Mach 10! They flew directly over the top of the Constitution and Fort Independence. A fellow photographer commented that they must have flown to Connecticut, because it took them about twenty minutes to return. In the meantime, the Constitution was treated to flyovers by Air Force jets, Navy helicopters, and Marine and Navy aircraft including what I think was a small AWACS jet. 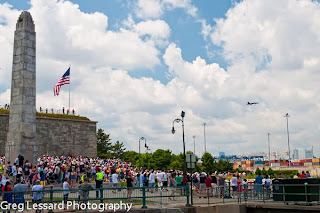 The Blue Angels then performed three flyovers to the delight of the crowd at Fort Independence. Even veteran news photographers for local tv stations were excited about the flyovers. One was jumping up and down in delight after getting the shot of the first fly over. Another commented "It never gets old, does it?" This was a truly exciting day that certainly stirred my patriotism. The crowd cheered wildly at each flyover and canon blast. 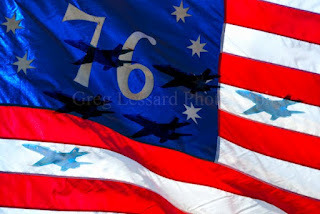 Patriotic marches played during the ceremony and music from Top Gun was blasted each time the Blue Angels appeared. It was uplifting to be a witness to this celebration of America! This photo is a blend of two photos. The photograph of the Blue Angels was taken today. The flag was photographed on Patriots Day 2008 in Lexington. 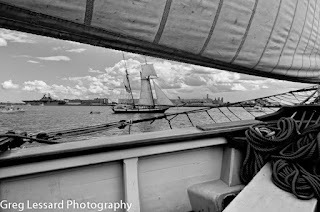 I will soon post more images of today's event and of my recent sail aboard the Pride of Baltimore II as it "battled" the Lynx in Boston Harbor. Happy Fourth of July!! Here is my latest edition of "Adventures in Photography" as it will appear in the Freebird Times. Every year I get excited about photographing lupine. They are one of my favorite flowers. When I first start to photograph them, I often photograph only the flowers. I will focus on them as large clusters of color and then work my way to the minute details of individual petals. Eventually, I will try a variety of “painting” techniques such as zooming and swiping, using slow shutter speeds to create impressionistic views of these colorful flowers. 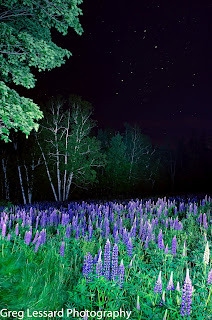 After running through my initial excitement of seeing, smelling and photographing the lupine, I start to look for images that include the lupine, but use them as background or foreground elements. Many of my favorite lupine images have come from finding a subject other than the lupine. 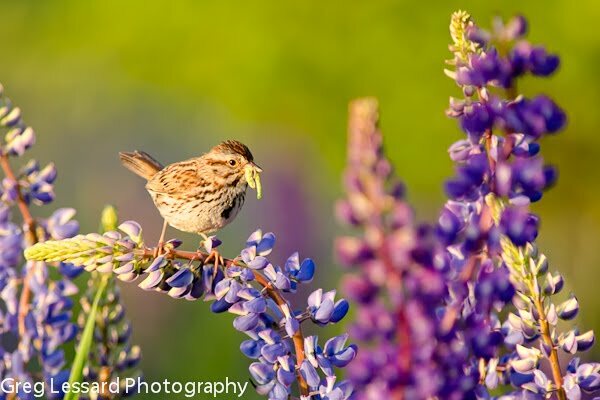 This image of a sparrow eating a green worm while perched on a lupine is a perfect example of this type of image. I was in one of my favorite lupine fields in Sugar Hill, NH at sunset, enjoying the beautiful light of the golden hour when I noticed a number of small birds hunting among the lupine. Goldfinches, bluebirds, and sparrows were diving in and out of the flowers looking for an evening meal. The goldfinches and bluebirds stayed quite a distance from me, but the sparrows didn’t seem to mind my presence. One sparrow in particular was flying from lupine to lupine in an established circuit. I was able to predict its movement and patiently waited for it to fly into my composition. After observing this sparrow for more than twenty minutes, it captured a small green worm. The sparrow then proceeded to fly from lupine to lupine on its circuit while calling out. I am not sure if it was calling to its fledgling chicks or if it was bragging about its catch. After five minutes of flying from flower to flower, it finally ate the worm. Most people, myself included, don’t get too excited about sparrows. 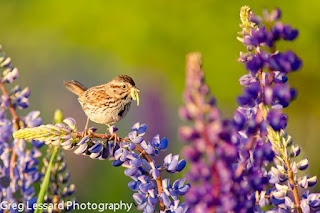 However, a sparrow perched on a lupine is an excellent capture. Add the worm and the image now has become quite interesting. Finding ways to add interest to your images is essential for improving as a photographer. I can hardly wait to include this image in my next bird photography workshop! This Month’s Tip: While most of the very best images are made by local photographers on their home turf, it is definitely worth your time and money to seek out areas that offer exceptional photographic opportunities. 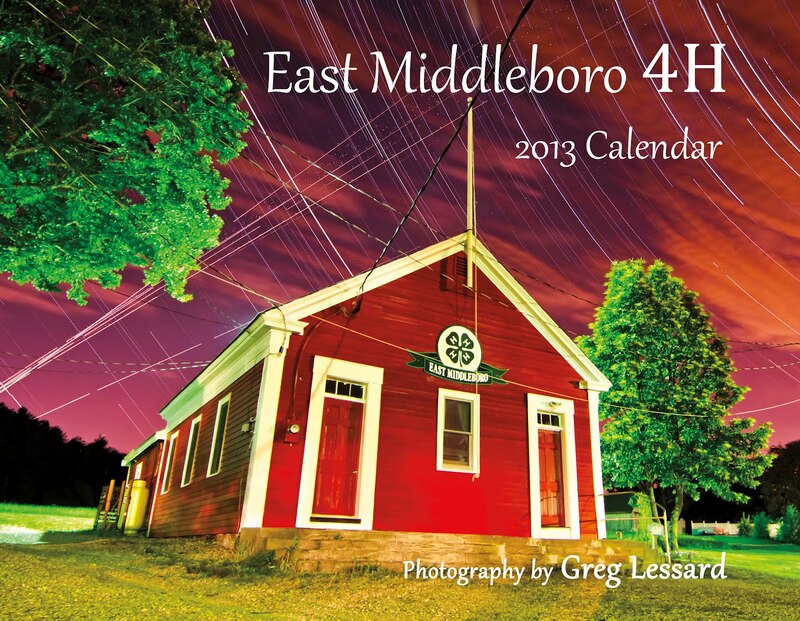 There are numerous festivals and locations throughout New England that can be absolutely stunning at the right time of year. New England in the fall is a premier destination for landscape photographers. 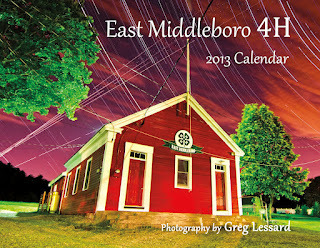 The harbor villages of Maine, dairy farms in Vermont, apple orchards in the spring and the fall, the Fields of Lupine Festival in Franconia, NH, moose alley in Pittsburg, NH, the South County Hot Air Balloon Festival in Kingstown, RI and the Op Sail 2012 event in Boston and New London, CT are just a few places that are within a day’s ride, where you can maximize your photographic opportunities. 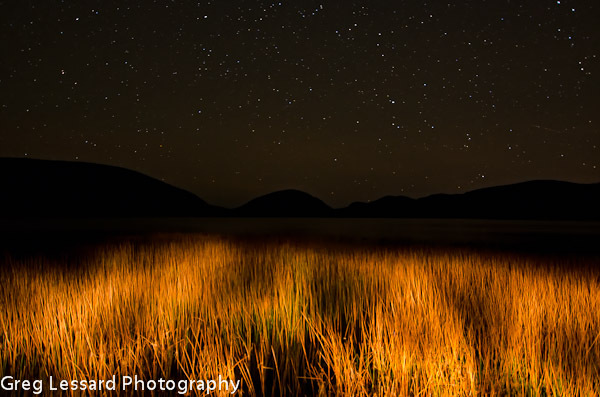 On Saturday, I went to Sugar Hill, NH to teach a workshop on night photography. 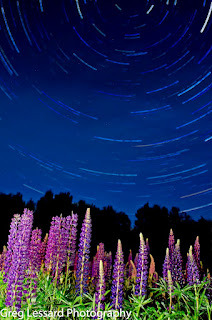 Members of the South Shore Camera Club spent the weekend in Sugar Hill, photographing the beautiful Lupine Festival. The focus of the night photography workshop was flashlight painting and star trails. We spent some time in the afternoon discussing various techniques and tips. In the evening, we applied the techniques in the field. I was able to make a few images during the workshop. The star trail image is a composite of more than one hundred 30 second images. I had shot 3 hours worth of images, but clouds moved in for the last hour and a half, covering up the star trails in the lower half of the sky. So in the end, I only used an hour of images to make this photo. 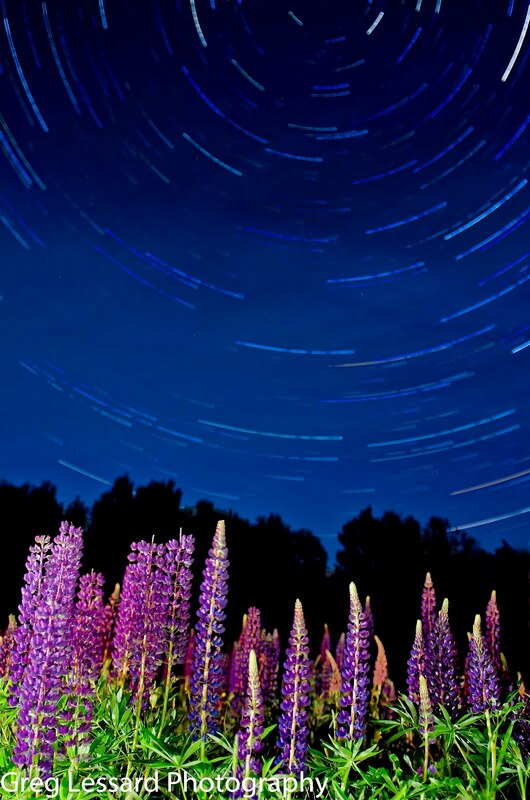 I also blended the foreground flowers from one image on top of the composite, because there was a very slight breeze that forced the lupine to sway, making them appear out of focus in the composite. All told, this image took about ten hours of work, but I had a lot of fun making it! The other image is an example of flashlight painting. As a team, we lit up the scene before us, with multiple flashlights for a single 30 second exposure. Flashlight painting is one of my favorite techniques. It is a lot of fun and you can easily make unique and beautiful images by painting with your flashlight. I'd like to thank the SSCC and my friend Carol for arranging to have me teach this workshop. I truly enjoyed meeting and working with everyone!